Nicaraguan-born Roberto de la Selva (1895–1957) moved to Mexico City in 1921 in protest against U.S. military occupation. He stayed for the rest of his life. 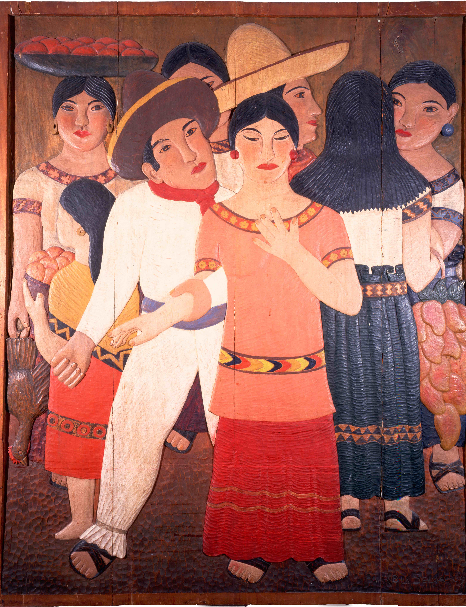 “In a period when Diego Rivera and Pablo Picasso were the world’s most powerful artists, Mexico was where the action was—where modernism and politics intersected,” said curator Marion Oettinger Jr.
De la Selva studied art at Mexico City’s Academy of San Carlos and apprenticed as a wood craftsman in Apizaco. Working in dense white mahogany, he produced bas-relief panels that meld traditional woodworking—a prized pre-Hispanic craft—with modernist painting and the social zeitgeist of post-revolutionary Mexico. “His message of the new order honoring folk art, indigenous people, and the working class helped shape that period’s understanding of what Mexico was about,” said Oettinger. The small exhibition includes seven large-scale bas-reliefs and six smaller reliefs. © 2016 San Antonio Museum of Art. All Rights Reserved.